Quinn (Katie Lowes) was tasked by Charlie to keep OPA from finding out they’d killed the security guard witness. Eventually, OPA was able to locate nearby security cam footage, which showed a reflection of the murderer. Quinn was relieved when Huck (Guillermo Díaz) wasn’t able to enhance the footage enough to discover the identity. However, when Quinn later came home, Huck was waiting for her. He really had been able to reveal it was her. He wanted to know who she worked for, and he brought his torture tools! Now, Quinn is annoying, and useless, and a liability. She basically just takes up space. But. Huck did help destroy her life, so I really don’t think he should get all judgey and torture her next week. Besides, she seems like she’d break on her own, without any pressure, and still spill the truth. Josie Marcus’ (Lisa Kudrow) sister/daughter/campaign manager apparently failed history. She decided to pull a “Watergate,” but was found out in a couple of days. She staged a break in at Marcus headquarters, then tried to set up the Reston campaign. When the cops discovered it was an inside job, OPA had to scramble to save Josie’s chance at the Presidency. First, Josie would have to fire Candace. Instead, Josie gave a press conference taking the fall. She would take a plea and return to her home state. She didn’t want to cause her daughter any more pain. Right away I thought Candace was behind the theft. However, I thought she might have been being vindictive to get back at Josie for lying about maternity. She seemed really distraught Josie had to leave the race, though. I just wish Candace had shown better judgment, or any judgment. I would have liked to see Josie Marcus make a run for the White House! When Eli (Joe Morton) told Maya (Khandi Alexander) she was being moved to a prison outside of the country, she asked to see their daughter. He refused, but later showed her some newspaper clippings about Olivia’s (Kerry Washington) accomplishments, after she tried to kill herself. It looked like this suicide attempt was a plot, so she could break out from the hospital. 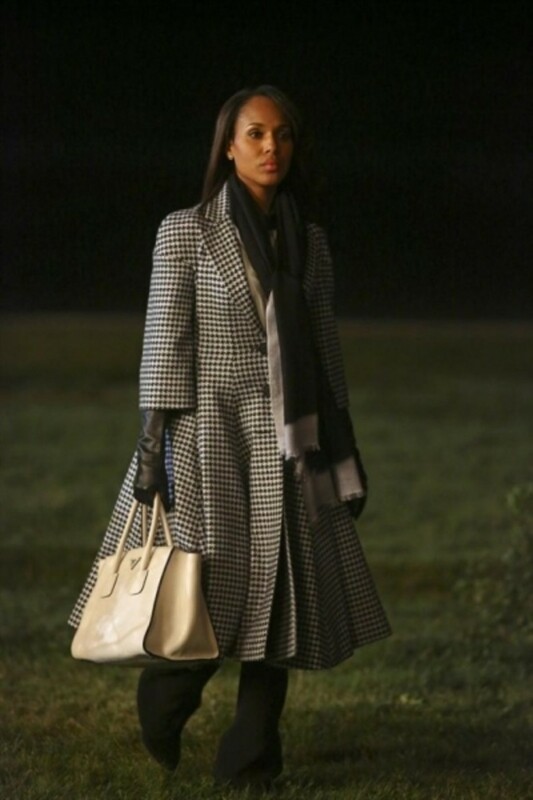 When she did, she approached Olivia on the street. Olivia was stunned. How gross was Maya gnawing at her wrist? It was so gruesome and straight out of True Blood. If she’s willing to do that (until she found an artery! ), she must be some sort of trained super spy! I’m not entirely convinced she genuinely wants a relationship with Liv. I hope she doesn’t destroy the fixer too much though, since it was still looking like Olivia might have a nervous breakdown. Cyrus (Jeff Perry) and Mellie (Bellamy Young) were still scheming to blackmail Sally Langston’s (Kate Burton) closeted husband, Daniel (Jack Coleman). Phase One was Mellie gossiping to Daniel that Cyrus and James had an “open marriage.” Next, Cyrus orchestrated an intimate interview between the reporter and political husband. Cyrus would have a photographer waiting nearby to take some pics when Daniel made his move. Mellie cautioned Cyrus might not want to open the door to adultery, but Cyrus was confident James wouldn’t reciprocate Daniel’s affections. Later, when Daniel hit on him, James realized what his husband had done, and looked gutted. Cyrus didn’t look much better, when his PI sent him pics of Daniel and James being intimate. Before Cyrus got the pics, I thought James was only going to make Cyrus think he cheated for payback. However, it looked like James finally had enough and just wanted some affection — or revenge. I was not happy Cyrus was giddy about pimping out his husband. The total lack of respect Cyrus shows his husband is appalling. James should pull a “Fitz” and start throwing around the D-word: Divorce. You know, Fitz (Tony Goldwyn) can be a jerkface. I love him, but it’s true. When he wants to throw on the charm though, it’s hard not to swoon. Like, there should be a “Warning” before Scandal airs every week, so ladies can get their smelling salts ready. 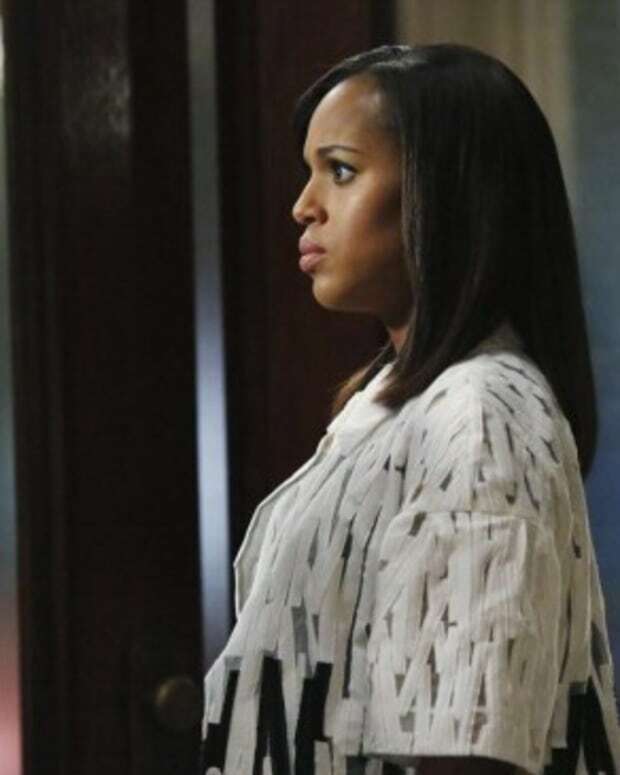 Olivia was giving Fitz the silent treatment, which was making Fitz all depressed again. Instead of going for the scotch though, he decided to try a grand romantic gesture. He got Olivia to meet him at some house in Vermont for one hour. No sooner had Olivia gotten off the chartered chopper did the pair begin to fight. Fitz thought Olivia should have revealed who her dad was. She countered she never talked about him — period. She also admitted to not wanting to scare Fitz off. Fitz said he was always as honest with her as legally possible. He would have protected her, no matter who her dad was. Before Olivia stormed off, he revealed the home they were standing in, was their home. He’d had it built so the fantasy life they always talked about could become a reality. It was a place he wanted to raise a family with her, and watch her make jam. Would it be possible for anyone to spurn their lover after that? They made love, and ended up spending the night together. Olivia told him not to sell the house after all. Fitz told her he was going after Eli. Olivia gave him her blessing. This was probably one of my favorite moments of the season thus far. Whenever Olitz angst/love scenes get underscored by “The Light,” I completely fangirl out. That’s their song! It is so perfect. Could they every really be together? 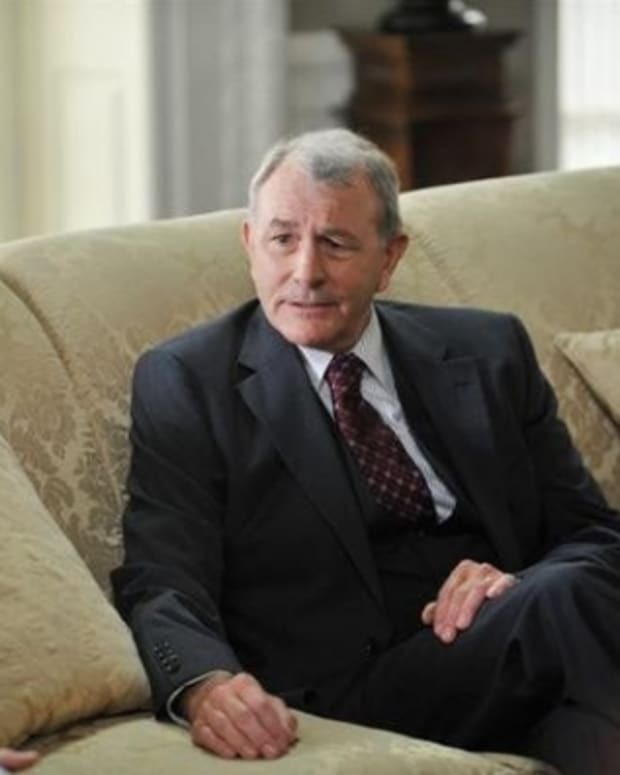 Even if Fitz lost re-election, could he leave Mellie to be with Liv? They have a political marriage, and after his career ends, he’s supposed to stand by her, and help Mellie claim the presidency. 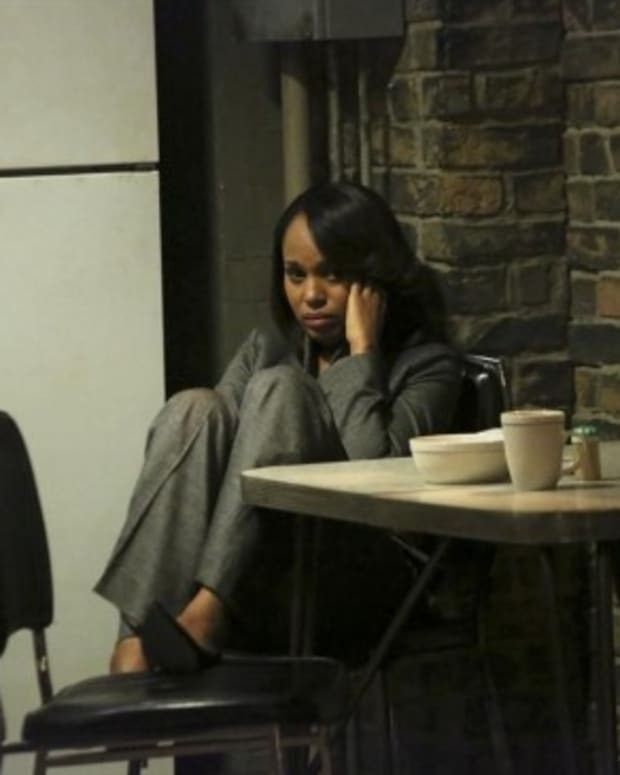 I don’t think Mellie would ever fade quietly away so that he can play house in Vermont with Liv. * Mellie thought things might be getting better between her and Fitz. 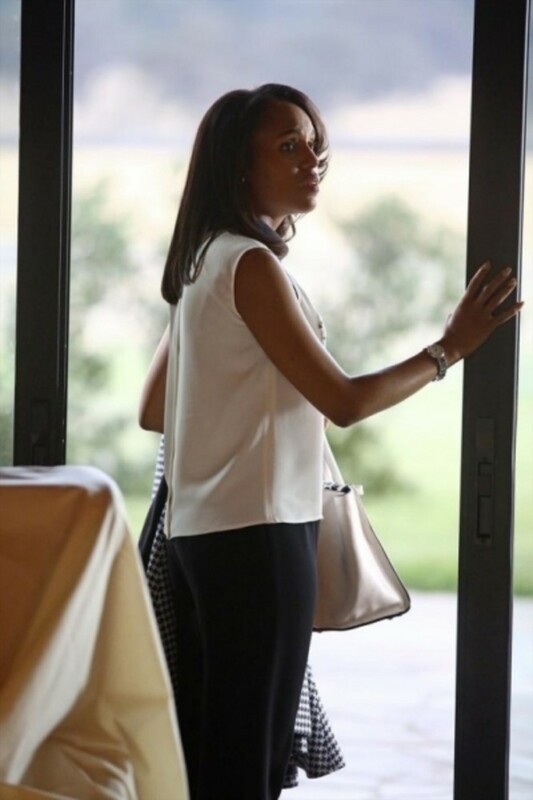 However, after discovering both Fitz and Olivia were missing, she realized they’d rekindled their affair. She was hurt and angry. As much as I want Olitz together eventually, I want Mellie to get her shot at the White House. At least now it looked like Olivia will come back aboard the Grant campaign with Josie out of the race. * Harrison finally had a hook up. Unfortunately, it was with that awful Candace. Even more unfortunately, it happened entirely off screen. *Should “The Light” by The Album Leaf play weekly?